Welcome to our little get-a-way in beautiful Southern Utah! This condo is beautifully furnished and is close to a large number of activities. It has has a large 42'' flat-screen TV, washer and dryer, and a nice top-floor deck that has plenty of privacy to enjoy an outdoor meal if desired. There is also plenty of pool equipment for the kids to use during your stay. The clubhouse has plenty to do for both families and couples. It has a family pool and an adult only pool, hot tubs, tennis courts, racquetball, basketball, play areas for the kids, shuffleboard and plenty of other activities. The area around the condo has plenty of shopping, restaurants, movie theaters, and other activities such as hiking, biking, mountain biking, etc, You can also find almost any type of restaurant or store in the St. George area as well. Just outside of St. George, there are 2 National Parks, Zion and Bryce, several State Parks, Snow Canyon, Quail Creek, Sand Hollow, Gunlock Reservoir, and Beaver Dam. Tuacahn theater and Snow is within a 15 minute drive of the condo. There is plenty of hiking, biking, boating and plenty of sightseeing and other activities close by as well. 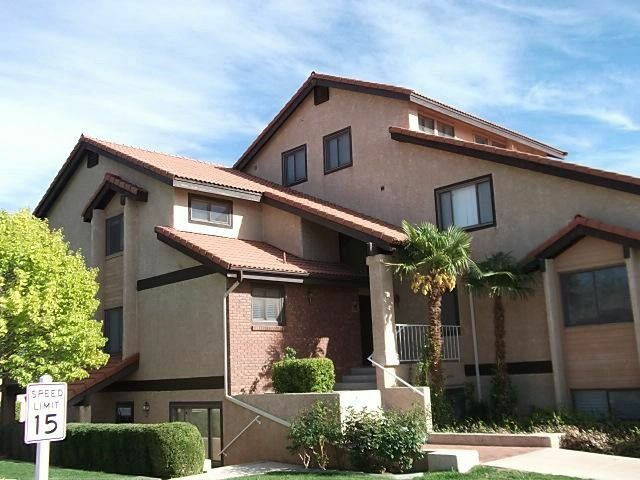 This condo is a perfect place for a couple or a small family who are looking for a great stay in St. George. We are from the Salt Lake area and always enjoy visiting Southern Utah (not only St. George, but Moab too). We thought it would be a good idea to have a place where our family could go for a quick getaway. Since our children love so many different activities, we decided to purchase a place in St. George where our kids can do everything from just hanging out in the pool to extreme sports like like mountain biking, right behind the complex. Sports Village was a perfect place. We found this unit and fell in love with it. We wanted to share it with others when we were not there so we decided to list it on VRBO and HomeAway We hope you enjoy it as much as we do. St. George is a great place to get away from the colder weather in other parts of the country. It is also an excellent summer location because there is so much to do and see in the area. You can explore lava tubes in Snow Canyon, hike through a slot canyon at Pioneer Park or visit several National and State Parks and be home in time to choose from any kind of restaurant within a 5 to 10 minute drive from the condo. It is a great location. Troy's condo was exactly as advertised. It was clean, quiet, and comfortable. It was in a great location in the complex and centrally located for easy access to points of interest. And, contrary to previous reviews, the water heater worked great! Couldn't have asked for a better experience. Nice and clean and fit our needs perfectly! Super nice Owner. Wonderfully stocked. Very nice condo in a nice neighborhood. My family enjoyed staying in this condo. It was clean and well maintained. It is also very close to the Green Valley Loop mountain bike trail. We’d definitely stay here again. We had two couples stay and there was plenty of room. Big couches, deck, and bathroom with washer and dryer. The kitchen is great! We made our Thanksgiving dinner there. Definitely recommend! Clean, quiet, and fit my needs perfectly. Troy, all went well. Your unit was perfect for my needs. I used St. George as a base camp to check out Snow Canyon State Park, Santa Clara River Reserve, and Zion National Park. The property was as advertised. It was clean, quiet, large deck, plenty of parking, and the bed matress fit my back well. National Parks, State Parks, Off-road driving. Monthly rates are not available during February, March, April or October. If you have questions or want to use a coupon or gift certificate, please inquire before paying on-line as additional discounts may apply. Rentals over 30 days in length require a 60 day notice to cancel without fees. 2 night minimum stays are required on weekends unless one night is already booked. Security deposits will be refunded within 7 days of your departure.